My daughter loves sloths, tea, and mugs. This was the trifecta! I think she cried a little. LOL It really is adorable. His little bum seems to be a little too high to steep tea properly, but she assures me that as long as the water level is high enough in her mug, it’s a non-issue. She loves it! 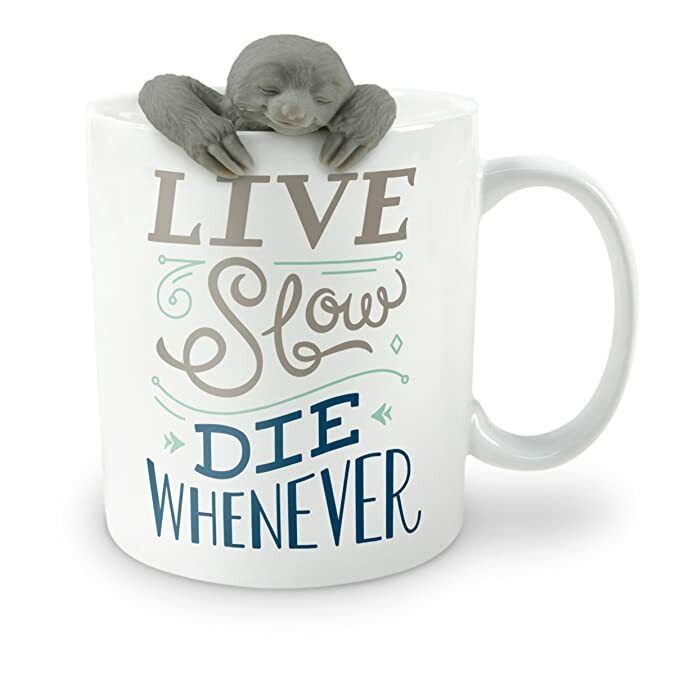 Sloths know how to live. Follow their lead, kick back, and take a long, slow sip of perfectly brewed tea. TWO FOR TEA includes Fred’s SLOW BREW infuser and coordinated mug; it’s the perfect combo that’s guaranteed to make you wear a smile. The Infuser is made from food-safe silicone. Simply pull apart the infuser and add your favorie loose tea; steap as long as you like. The mug is crafted from high-fire, ceramic and features ‘Live Slow Die Whenever’ sentitment. This set makes a great gift for the tea lover in your life! Remember, only authentic SLOW BREW’s will have the Fred logo on the back of each top. Infuser and mug are dishwasher and microwave safe.